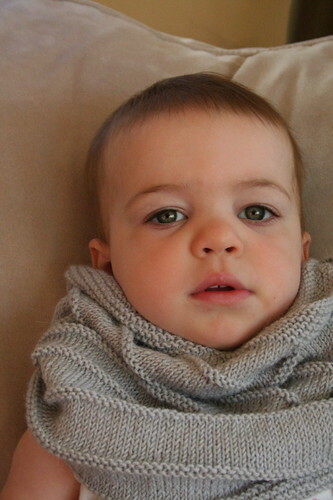 Thanks for your sweet comments about my new cowl pattern. You should see some of the others too: Nova’s Birthday Cowl, Caro’s Philly Cowl and I’m certain that Ashley and Minty are working up their patterns as I type! 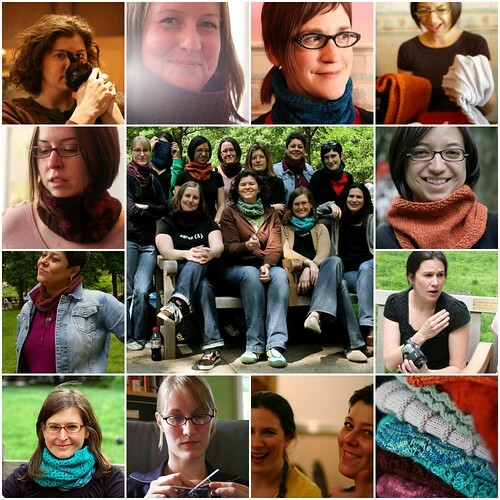 Look for them in the coming weeks because nothing says summer like cowl knitting. While mowing last week, Aaron found a rabbit nest a mere five feet from our tomato garden. I had already noticed some leaves nibbled down to stumps. Sadly, this could not remain. The rabbits can have any plants but tomatoes! Lawanna told me how to move the burrow and so that’s what we did this weekend. Between this and a trip to a nearby farm with chickens, geese, turkeys, ducks, peacocks and ponies, Beatrix squeezed a whole childhood’s worth of Nature into two days. She was delighted, terrified and, most importantly, exhausted. And as for the bunnies, there were five of them and all five are still alive and settling nicely into the new burrow. I feel terribly guilty about uprooting helpless babies so I’ve been checking in on them every day. I took some time this weekend to work on a few sewing projects. Here is the latest addition to the toddler wardrobe. I bought three yards of this on eBay last winter so you will certainly see more of it in the future. 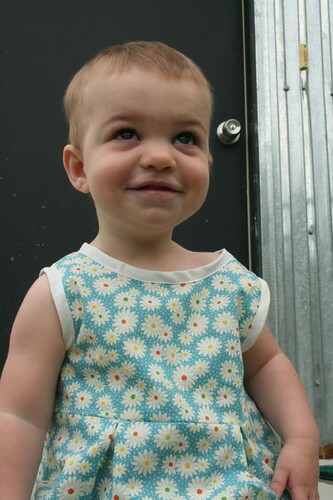 I used about a yard of it and made the size 2 dress, which is a little big (wide) but otherwise fits well. 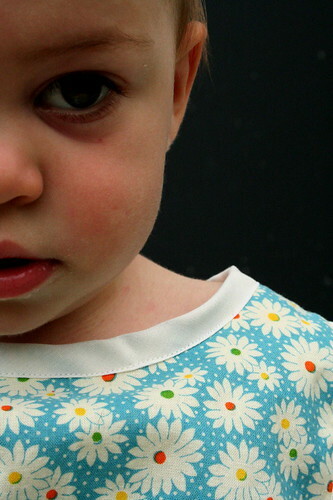 These tank dresses make diaper changes a breeze and allow lots of room to grow. I also like the idea of dressing my daughter in something that is not bubblegum pink from Target. While my zippering skills have improved, I admit that I ripped out two zippers this weekend. I am surprised and relieved that this zipper looks clean (there was a great deal of cursing setting it in). The pleats were supposed to be basted in place until the bodice and skirt were sewn together. 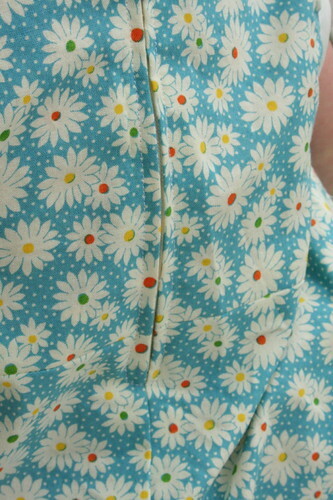 However, I rather liked how the stitching looked so I left it in place. 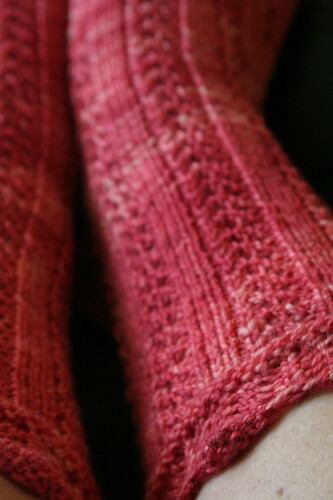 Lastly, I keep meaning to blog the lovely socks I knit in transit to Philadelphia last weekend. As I was catching up on blog reads this morning, I saw that Tiennie practically wrote my post for me! As it turns out, we both started a pair of socks with some Sundara yarn on the way to Philadelphia, we traveled to the same yarn shops and we finished our socks on the way home. The travesty is that we missed each other by mere days!! I suppose this means I should be looking for excuses to travel to Seattle! 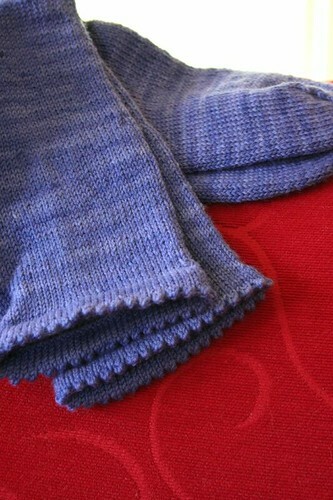 Modifications: I separated the cuff and the leg with two rows of purl. 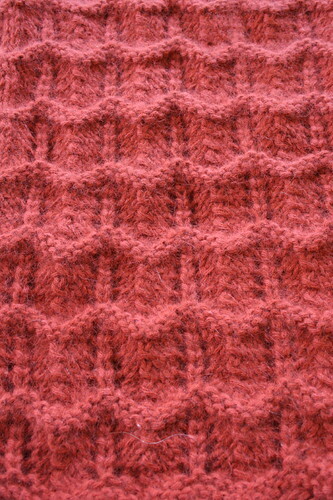 Also, I did not knit the lacy cables down the stockinette ribs because I thought it looked like overkill in the book. As it turns out, I should have waited a day or two for Terhi’s magnificent version. I might need to give these another try. Katy also just started a pair. See? All the cool kids are doing it. You need a pair. As it turns out, I missed a glaring error with the one sock until it came time to take the FO pictures: one of my lace panels abruptly stops on its way to the heel flap. I would never frog a sock back to the heel once the pair is deemed finished so I will live with a little imperfection. Pam sealed the deal by pointing out that less lace will make the heel more sturdy in shoes. In the end, a 72-hour pair of socks? What a deal. I wonder if this is what it would be like to be unemployed and kid-free (or, in college) as a knitter. I could knit the world socks! Stay tuned for more sewing and a mad rash of startitis! 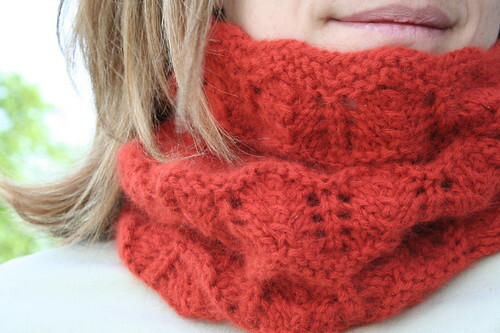 As I mentioned yesterday, I made two other cowls last month. I thoroughly enjoyed knitting with this yarn! 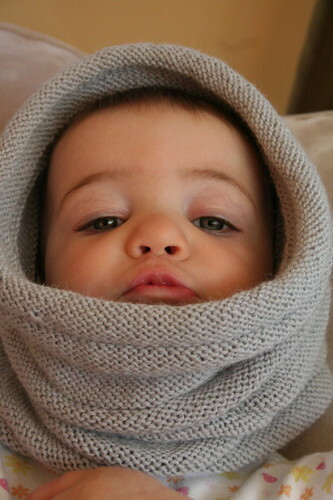 It is so luxurious – soft, warm and shiny! I would most certainly call it bling for knitters. 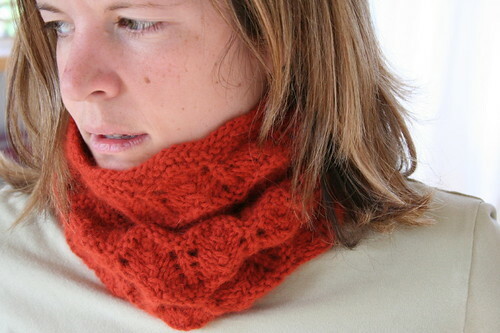 The Aspen Neck Cowl is supposed to have the purl side out but I rather prefer it with the knit side out. 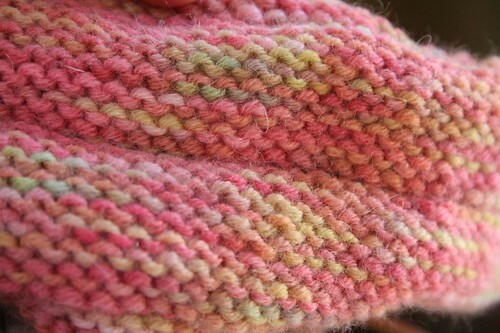 I love those purl ridges. They were, in fact, the inspiration for the second cowl. 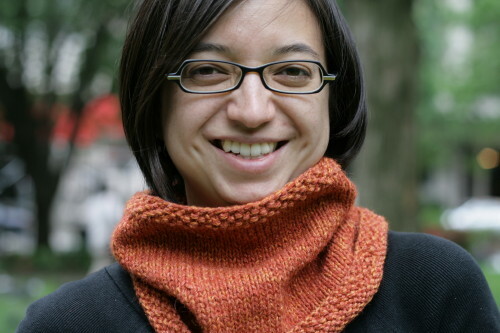 For lack of a better name, I’m calling this the Ridged Lace Cowl and you can find the free pattern here. The stitch pattern is so simple that I am not even going to bother with a pdf. If you decide to knit it, please let me know what you think! 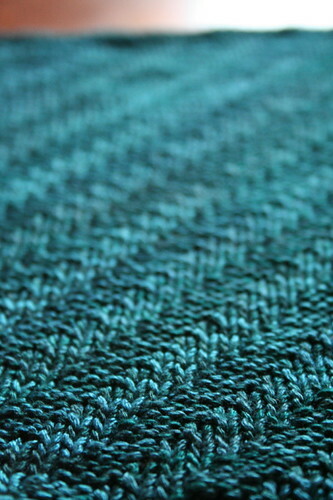 Here is a closer view of the stitch pattern, although the color is a bit washed out. Bright orange is difficult to capture! The photos above are better representations of the color. Stay tuned for some Nancy Bush socks! Last Friday, I took my last exam then promptly drove to the airport to meet up with Ashley, Caro, Christy, Diana, Jennie, Julia, Maritza, Megan, Minty, Nova, Pam and Specs in Philadelphia. Unfortunately, Nova hurt her back and Jennie got sick (and then got a PhD!) so I missed them, providing plenty of reasons to plan another knitting weekend. The rest of us communed over good food and even better yarn for a weekend of knitting-related silliness fun. I scored an amazing cowl in a little swap we planned. 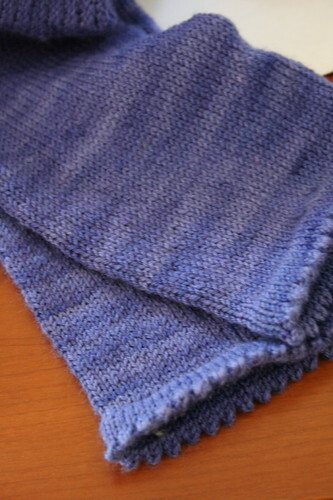 Diana knit me the most beautiful, silky blue cowl in a traveling rib pattern. Would it be in bad taste to wear it every day? 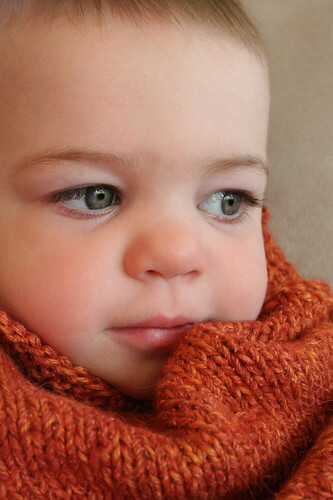 I cannot stop looking at my lovely cowl; the color is very striking! Look at the stitch definition! Stunning! The yarn is Tilli Thomas Fil de la Mer and its content is 70% silk and 30% sea cell. 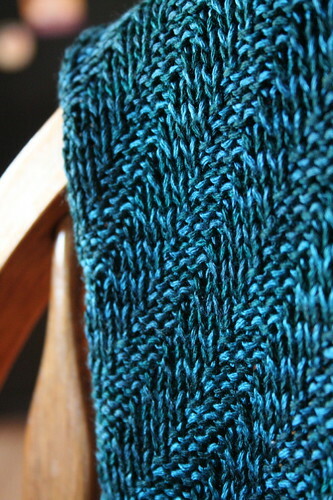 I knit a cowl for Minty out of Blue Sky Alpacas Alpaca & Silk held together with Plymouth Royal Llama Silk. 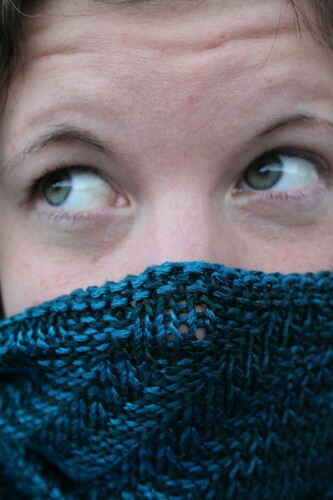 Actually, I knit three cowls for this swap (more on the other two later). I could not decide which one she would prefer so I brought all three and let Minty choose. She picked the first one I made! I admit to liking this one the best, even if it is the simplest of the three. Here’s Beatrix modeling it before I left. In the interest of brevity, I will save the other cowls and the pair of socks that I started and finished over the weekend (incredible!) for my next post. After Maryland Sheep & Wool this year, Lolly commented the dread she felt about the post-festival blog post: there is so much to say, so many pictures, so many links. I feel the same way about my weekend in Philly. For that reason, I will let Flickr do the rest of the talking. Needless to say, it was great fun and I look forward to a sequel! Babies! Swaps! No way are you going to even manage a peek at all the knitting going on here! 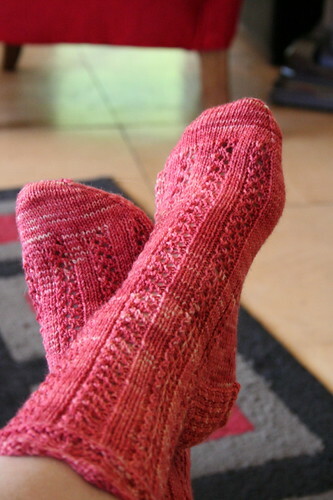 I offer you a drive by post on the socks I just finished for my mother-in-law. This is a basic 68-stitch cuff deceased down to a 60-stitch foot. I’ve been studying like mad so I needed a project that was even more mindless than usual (why bother knit, really?). I like how these look but I admit that stockinette socks always end up being more work than I anticipate because I count rows to match the second sock to the first one. A few people from my knitting group laughed and suggested a tape measure would yield more or less the same results but I prefer to match my socks to the row! Next up is a great stashbuster! This is the beginning of the Aspen Neck Cowl (Rav link here) with Posh Yarn Emily. This is actually inside out. 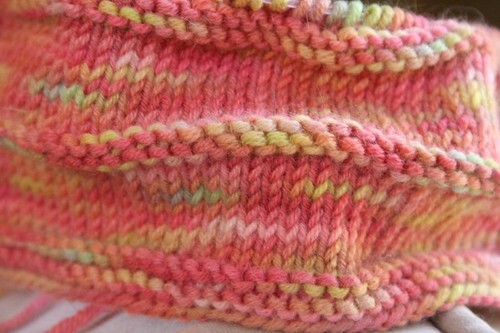 I prefer knitting this pattern inside out because I knit faster than I purl. 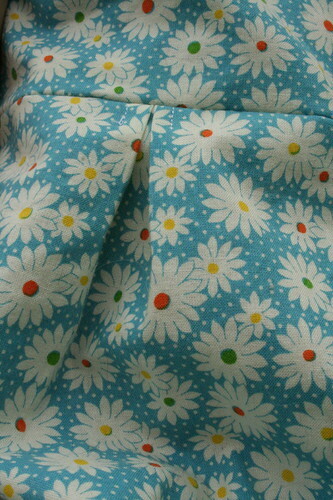 Here is the other side (the right side) of the fabric. Lastly, somebody has learned to knit! Or, sort of. 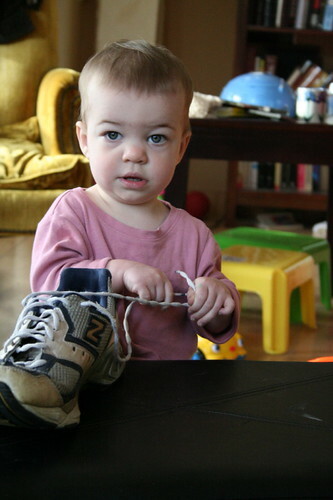 We caught Beatrix “knitting” shoe laces last week. How old does she have to be before she gets her first pair of needles?